Connections: Rockin' around the house. A young cowboy checks out the half-size horses. Who wouldn't have wanted one of these realistic carved wooden rocking horses in their bedroom ? It's true that they cost about the same as an unpapered live horse but then there's no feeding--or shoveling. I want one. Where can I locate? 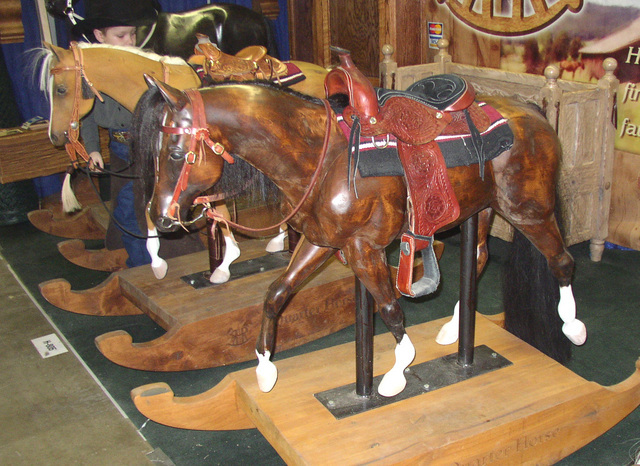 I saw them at one of our annual National Western Livestock shows in a product display hall. I love these rocking horses, please tell me where you saw them!